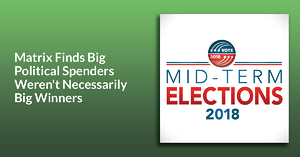 Matrix revisited its midterm ad spending totals to see how the big spenders fared in the 10 swing state Senate races where it had tracked local broadcast TV spending and, as of press time, more of the bigger spenders lost than won. Of the seven toss-ups where the races have been decided -- ballots were still being counted or recounts were in the offing in Arizona, Florida, Montana -- six of the biggest spenders were the Democrats, though only two won, while the lone Republican outspender, Marsha Blackburn, current chair of the House Communications Subcommittee, won her race. So, of the seven, spending leaders won three and lost four.